If you wish to spend your holiday in an smaller tourist place, it is the right choice for you. This pretty and functional holiday home is located in a small fishing place of Pomer. This modern and attractive villa boasts beautiful panoramic views of the Bay of Pomer. Take a dip in the refreshing private swimming pool or cool off in the sea. The holiday home is located in a peaceful street. It is fully equipped and suitable for pleasant holiday. On the ground floor there is one bedroom with its own entrance and a bathroom. This large holiday house with a swimming pool suitable for accomodation of a large company or more families is located in Pomer near Medulin. It consists of three floors connected by internal stairs. This beautiful holiday house on a small hill in Pomer with a beautiful view of the sea. On a small hill with a beautiful sea view, there is a holiday home which consists of two apartments connected by external communication. In the peaceful residential district of the small costal village Pomer, is located this spacious holiday apartment. It is situated on the ground floor of a family house and offers three bedrooms. 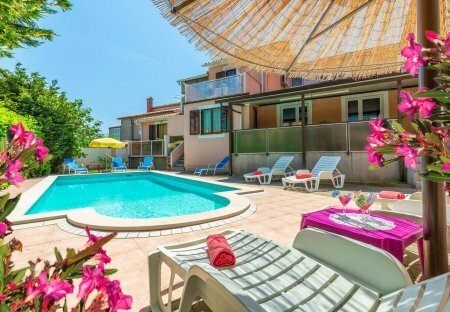 The simply and functionally furnished holiday apartments are located in a family house in a peaceful residential area of the village Pomer. This simple and functionally furnished holiday apartment is located in the center of the coastal village of Pomer. 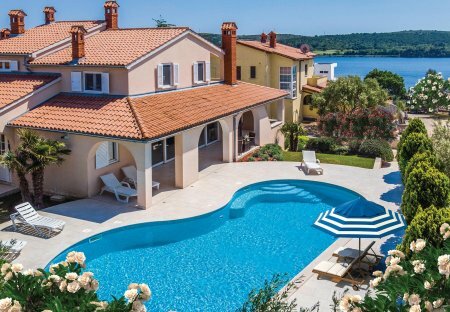 This spacious and comfortable holiday house is located in Pomer and was kept in the original architectural style of Istria. The interior of the house is dotted with traditional. Spacious and comfortable two-storey holiday apartment is located in the center of Pomer. The interiors are harmoniously and tastefully furnished, with particular emphasis on a large living room. In the tourist resort of Pomer, not far from the town of Pula, is this holiday home. It is a house in a row that has a separate fenced yard. The interior is simply and functionally decorated. This functional apartment is situated in Pomer. It has a covered terrace with barbeque located on the spacious plot. On hot summer days, guests can enjoy fresh air and relax on the terrace. This holiday home located in a quiet area near Banjole, occupies the entire first floor of a family house. The owner also lives on the property. Functionally furnished in 2011. This holiday home is in the centre of the tiny hamlet of Pomer near the sea. The swimming pool is a good place to relax during hot summer months.